Artist George Lloyd was on a mission to find a “real” farmer. 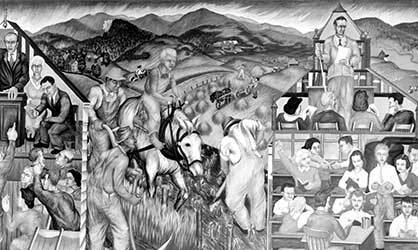 It was the spring of 1939, and, having been commissioned to paint a mural about agriculture that would cover one entire wall inside Hamilton Smith Hall, he wanted to be sure he could depict a New Hampshire farmer accurately. With UNH agriculture professors as his guide, he soon found his models out in the fields, piecing together a way of life in the aftermath of the Great Depression—much the way he was doing, himself. Lloyd was one of the unemployed artists who had been hired under the auspices of the Federal Art Project branch of the Work Projects Administration, a national program created by U.S. President Franklin D. Roosevelt to provide productive work to some 8.5 million citizens in lieu of unemployment benefits. 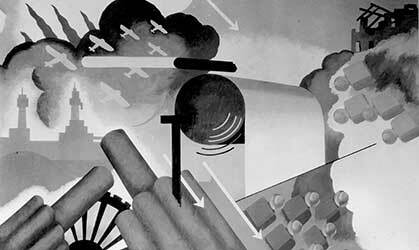 Coordinated by Manchester artist Omer T. Lassonde, at the time one of the country's most influential modernist painters, the UNH project included three massive murals, eight feet high and 40 feet wide, in the three main rooms of UNH’s then-library. Lloyd’s “agriculture” mural was to grace the reserve room. 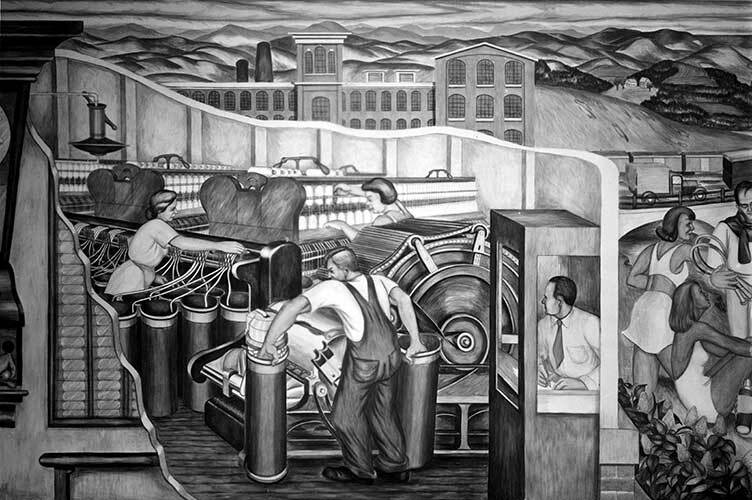 Arthur Esner was commissioned to depict industry in the reference room. And Gladys Brannigan was selected to capture news and information in the newspaper room. Both Lloyd and Esner painted directly onto Ham Smith’s gesso-surfaced walls with egg tempera, drawing their designs first on oversized sheets of paper and then painting the outlines through tiny perforations and onto the walls. Brannigan went a different route, using oil paints on canvas panels that she painted in her studio in Portsmouth. The finished panels were then adhered to the walls. When Dimond Library was built in 1958, Hamilton Smith was remodeled as classroom space and departmental offices. Lloyd and Esner’s murals, housed in the two wings of Ham Smith built in the 1930s, were untouched, but Brannigan’s canvas panels were removed and stored for later use. During a subsequent renovation in the 1960s, Esner’s mural was boarded over. Today, Ham Smith is the university’s most heavily used classroom building—more than 20 different departments hold classes in its halls, and the building has more classroom seats than any other. But the iconic building is feeling its age, and this summer will commence a total interior and exterior renovation that will include restoration of Lloyd’s now faded mural and the excavation of Esner’s. The Brannigan canvases, unfortunately, will not be reinstalled unless the project turns up a real surprise—after they were taken down in the late 1950s, they were lost.